I ended up with a frozen water pipe last evening. A combination of factors all came together at the same time. The first was that I wasn’t paying attention to the wind direction yesterday. The wind was from the WSW and was sometimes as high was 20 mph. There’s something about that wind direction that has caused me problems for years. I guess that wind hits the back edge of the cabin where the water comes into the house just so. Instead of paying attention to the wind, I was happy to see the temperature rising again, though it still hasn’t gotten above 20 degrees. The second thing that happened to cause the problem was that my heat tape quit working, which I hadn’t realized. I hadn’t been into the utility basement since the temperature took its nosedive. I did check it before the nosedive, but not since. I’m going to have to get that taken care of. I do let the faucets drip during the coldest weather, but I’d forgotten to turn one of them to drip, and at least one of the others wasn’t dripping very much. So there I was just after dark last evening with my hair dryer in hand, running the dryer over the pipe where it’s been known to freeze in the past. In my case, the problematic spot is around bends in the pipe, down near the floor of the basement. I was lucky this time. It only took about 10 minutes of work to unfreeze the pipes, so they can’t have been frozen for too long. Today, all faucets are dripping again. The best news of all is that tomorrow the temperature will finally rise above freezing for the first time in almost two weeks. That will make the chickens happy and me too. 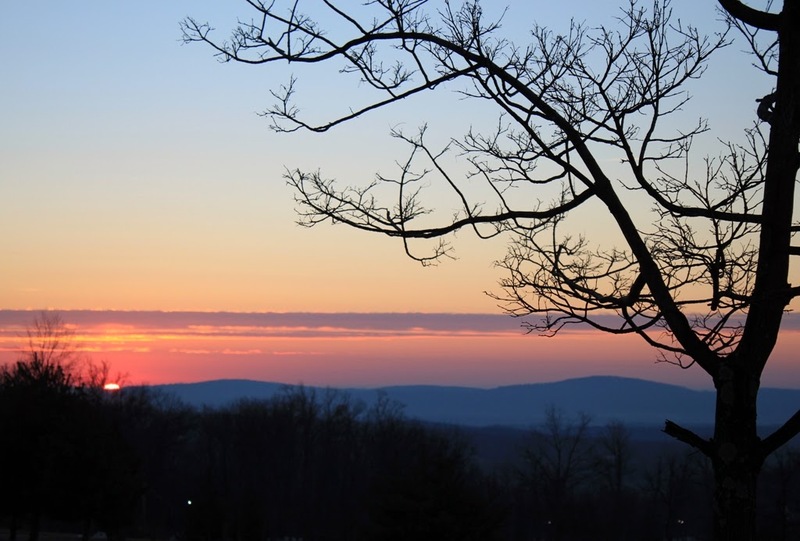 The deep freeze continues here on Roundtop Mtn., though this is to be the last really cold day for a while. Yesterday the temperature never reached double digits. I’ll be glad when I don’t have to pour hot water over the chicken pen door in order to get it open in the mornings. The chickens don’t seem too happy during this weather, despite a deep pile of straw in their coop. They barely come out of it long enough to eat and drink. Their water is frozen by the time I get home in the evenings. By then, it is late enough that they would be on the roost for the night even without the cold weather. In another few weeks, it should be light enough in the evenings for me to be able to give them fresh water in the evenings before their bed time, so even if the water freezes during the day, they will have a drink before their roost. This January is shaping up as one of the coldest on record for this area. It’s not the coldest on record, but it will likely be in the top ten. So far the average temperature for the month is a good seven degrees below average. I like winter, but I prefer an average one to one this constantly cold. Cold weather is settling in around my cabin in a way that I haven’t seen in a few years. 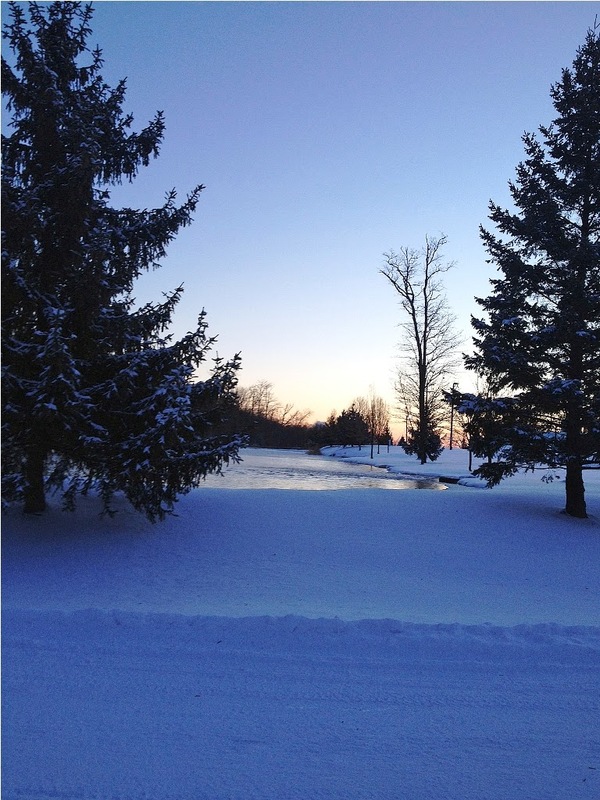 Below zero and near-zero temperatures are the norm at night. No evidence of a temperature rising above freezing, even for a few hours, is seen in the forecasts for the next 10 days or so. It’s winter as we used to get winters, at least for now. It remains to be seen how long this cold spell will last or what the rest of the winter will bring. Winter still has a long way to go before spring. For the most part, I’m enjoying the normal winter weather, though it wouldn’t hurt my feelings if it was sunny more often. 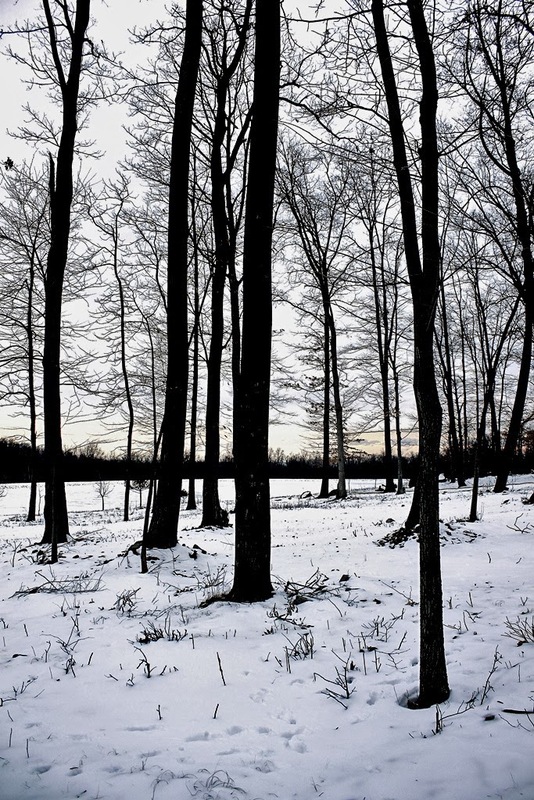 The forest is quiet, mostly sleeping until spring. Sometimes a vulture cruises by, or a Cooper’s Hawk scatters the smaller birds at my feeders. Occasionally, the scream of a pileated woodpecker, outraged by something, breaks the silence. But mostly those noises only make the silence seem deeper. I discover that a deer stood on my lowest front step, no doubt to better reach the top of the juniper bush beside it. I find the tracks in the morning. It was as silent in that unseen midnight raid as the forest around me. A rabbit bounced along the driveway, hopped the whole way around a beech tree and then headed deeper into the woods, passing within a foot of the chicken coop when it did. Rabbits are nearly always silent, winter or no. Day light progresses a little each day. I’ve been so observant about the minute of daylight I gain in the mornings that I’ve completely not noticed the progression of daylight in the evenings. No longer is it dead dark at 5 p.m. 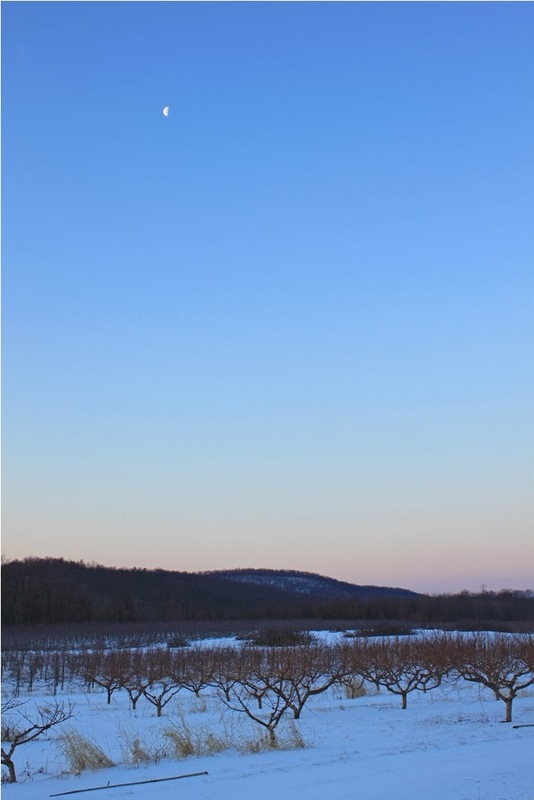 Yesterday, it was still quite light at 5:20 and a little light remained in the sky at 6 p.m. I find that a welcome change. I may still hibernate in the cabin after dark when the temperature begins its nightly nosedive, but at least I have a few more minutes each day before that happens. I wish I knew how much snow fell during yesterday’s storm. It’s the lightest, driest, fluffiest snow I’m about ever encountered. Combine that with 20 mph winds and an accurate tally is impossible. In places I can see bare ground and a few feet away a drift is 3-4 feet deep. My best guess is that 7-9 inches fell. This morning the temperature was -3 at the cabin, with a predicted that might, just might, reach double digits. From my vantage point, this cold is only a hair better than the much-touted polar vortex of last week. And what might make this cold worse is that the temperature won’t reach freezing again for at least a week. That vortex cold dissipated after 24 hours. Today I am digging out, checking the chickens (so far okay), letting the faucets drip so the water pipes don’t freeze and doing assorted other cold weather chores. Puppy Skye was just getting used to going outside to do his business and now I feel it’s too cold to let him out. He’s not thrilled with the idea of using paper, but I don’t want him to get sick, either. The day before the latest snow arrived, the weather was balmy, as is typical before a storm. So the chickens were out and enjoying their freedom. After enjoying wild bird seed kicked out of the feeders, they figured out they could enjoy more of it if they jumped up on the feeder table. Chickens are pretty smart when it comes to food, and mine are no exception. 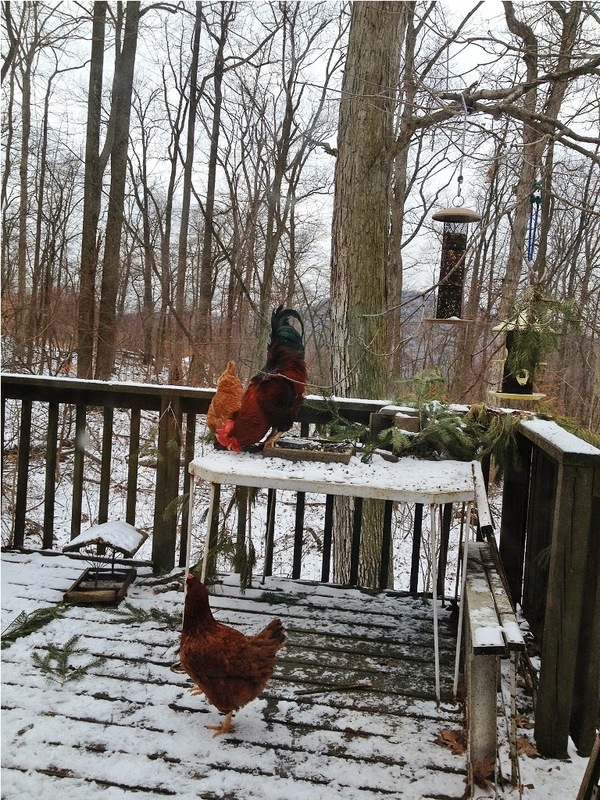 And after all chickens are birds, too, so why shouldn’t they use a bird feeder? Skye is starting to settle in at the cabin. Baby Dog is perhaps a tad jealous, though she’s putting on a brave face. She likes him but seems a bit perplexed by it all. Naturally, the puppy is oblivious to any undercurrents. He has started to herd the cats. They are not amused. At the cabin, I’ve had a brief thaw. It’s nothing major, just a few hours in the afternoon that manage to claw above freezing. That’s enough to bring out some of the small forest denizens that were missing for several weeks. Last night a huge opossum was discovered eating cat food on my front deck, to Baby Dog’s outrage. She was further outraged around 4 a.m. by the appearance of two very large raccoons. None of these visitors caused any mischief. They were just out and about prowling for food and seeing if they could find any. The raccoons raided the bird feeders, so I guess I’ll have to return to bringing the feeders in at night, an option I don’t much care for. The house cats like bird seed, too, and finding a spot to keep the seed away from their reach isn’t easy. It only makes it more difficult for me to replace the feeders in the morning, too. Another snowstorm would send the raccoons scurrying back to where they’ve been hiding. I’d be okay with that for another few weeks. Long-time readers of Roundtop Ruminations may remember that my beloved Dog died last spring. Baby Dog and I became a one-dog household. Until yesterday, when a new “baby dog” arrived at Carolyn’s cabin. 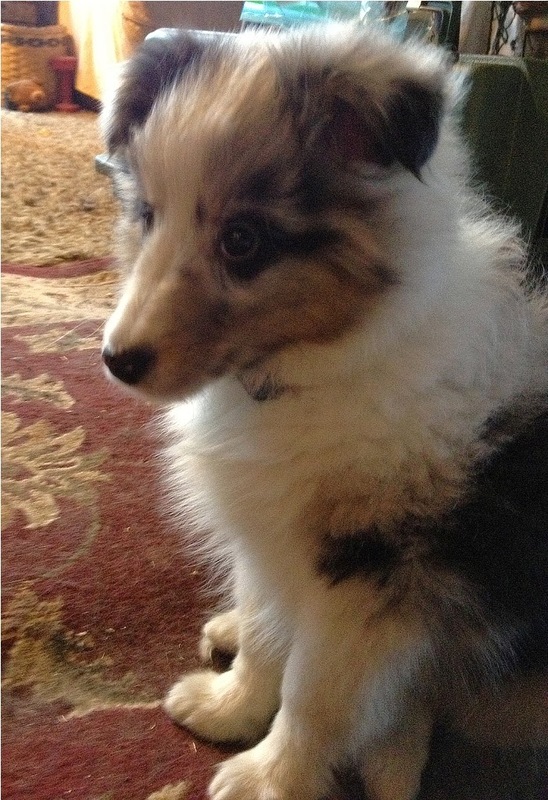 His name is Skye and he’s a Shetland Sheepdog. Still only 5 lbs and 8 weeks old, his small size is taking some getting used to. During Dog’s last months, I had to use a ramp and a sling to get him up and down the 5 steps at the cabin, and at 60 lbs. that was quite a chore for me. I decided then that my next dog would be smaller. At the moment Skye is smaller than the cats. That won’t last. I’m sure the cats are hoping it will. What’s that I see peeking up from behind those trees? Why, it’s...it’s the sun! I was overjoyed this morning, for two reasons. The first is that this winter and late fall have been almost unremittingly gloomy and overcast. 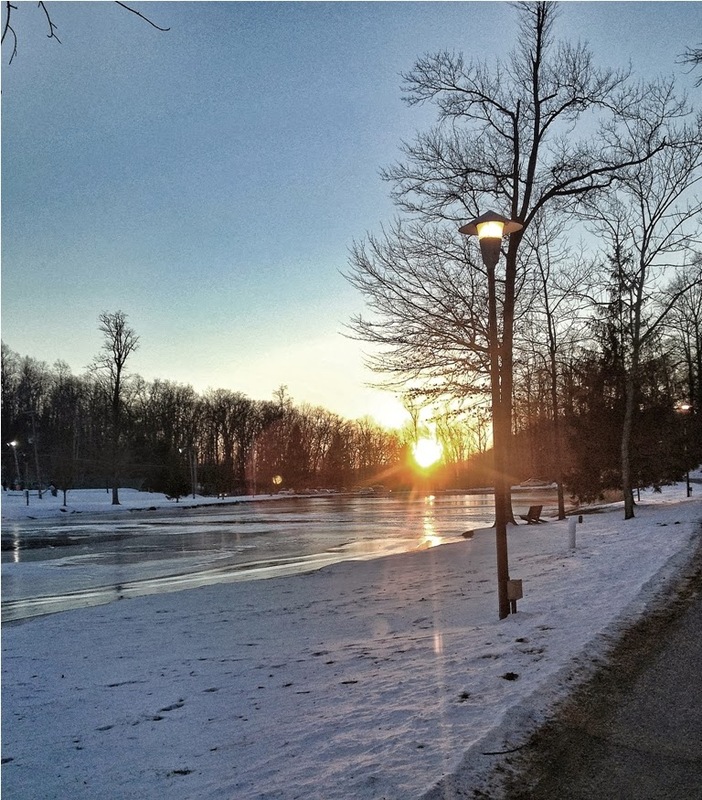 The sun has been in short supply, even in these short days of winter. I actually saw my shadow yesterday for something approaching five minutes. That’s the most in several weeks and cause for celebration all on its own. The second reason is also momentous. 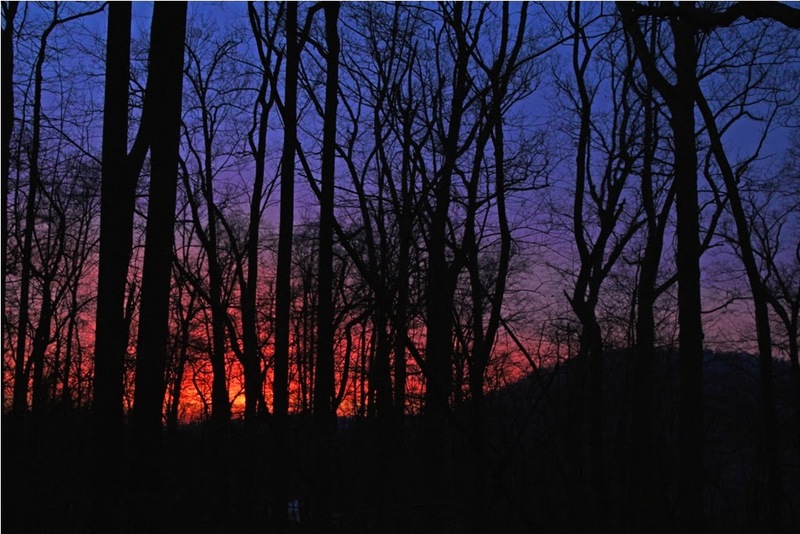 After sunrises were stuck at 7:30 a.m. for 14 days, the sunrise on Sunday morning was one minute earlier. 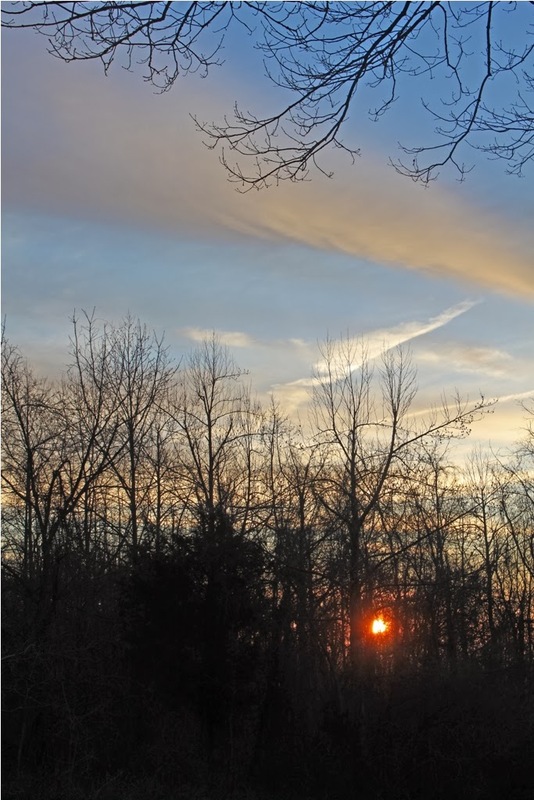 Here, the latest sunrise during the year is 7:30 a.m., and for the past 14 days that’s where it’s been. Until Sunday morning. Now if you do the math, you will soon discover that 14 days at the same sunrise time puts us at December 29, and as we all know solstice, the shortest day of the year, is back at December 20. So how can the sunrise be at the same time for a full two weeks? Because since solstice the sunset time has been a minute later every day. So the days are getting longer but all that length has been growing in the evenings, not in the mornings. Until Sunday. For three days the sunrise will be at 7:29 and then on Thursday I will gain another minute at sunrise. After that, I gain another minute at sunrise every other day until January 23 when things really start to rock and sunrise gains another minute every day. Finally, the days will start to feel longer again. The winter season is still new, though it’s already unusual for this area. I’m not talking about that polar vortex that numbed the mountain earlier this week. I’m talking about precipitation, mostly snow. I can’t recall a winter here where something fell out of the sky every three days. This area is often dry in winter. That’s why Roundtop makes snow. Winters are always cold enough for it to snow, but often weeks go by without any snow (or anything else) falling. So in order to have snow for skiing, they make it by shooting water into the frigid air, which then falls to the ground as snow on the slopes. This year, I barely get the driveway cleaned up from one storm before another one arrives. Most, so far, have been small or barely moderate-sized snows.. It’s just that getting snow (or ice or rain) every three days for weeks on end is really unusual for here. It’s good, too, that these snows have been kind of puny. A big storm every three days would not be much fun at all! 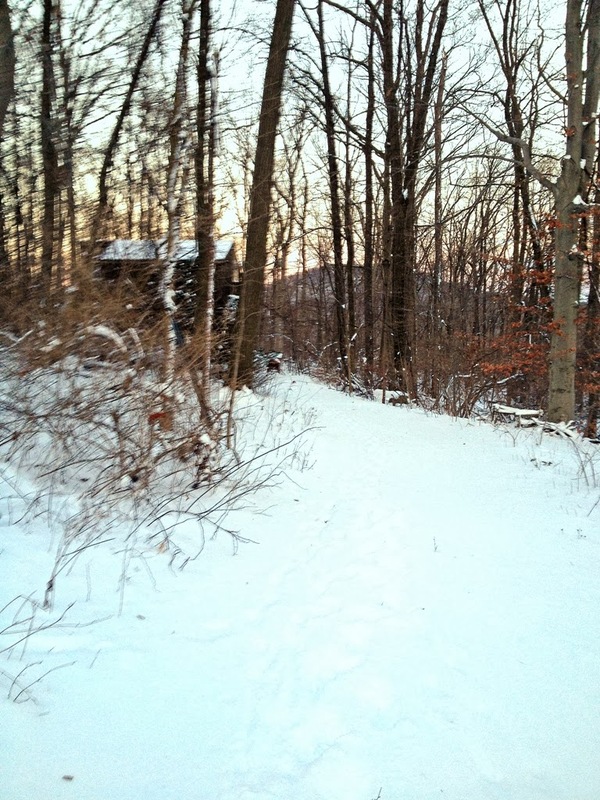 Today’s photo was not taken this morning—more snow was falling as I left the cabin. 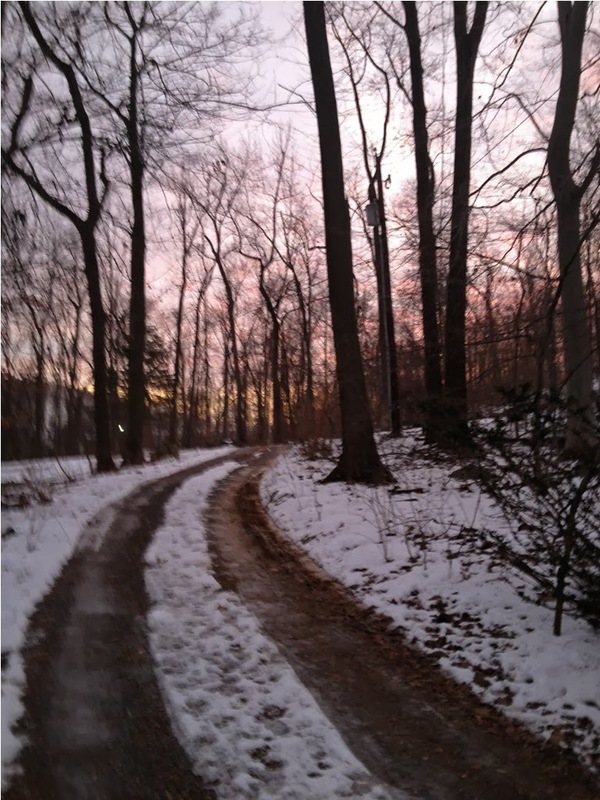 I took it yesterday when the approaching snow turned the sunrise pink as dawn broke. Talk about a roller coaster! Upper 40’s one minute and -6 degrees a day later. I can’t keep track of whether I need to wear snow pants or sandals. The wind has been terrible, with gusts up to 40 mph and sustained winds at 25-30 mph. 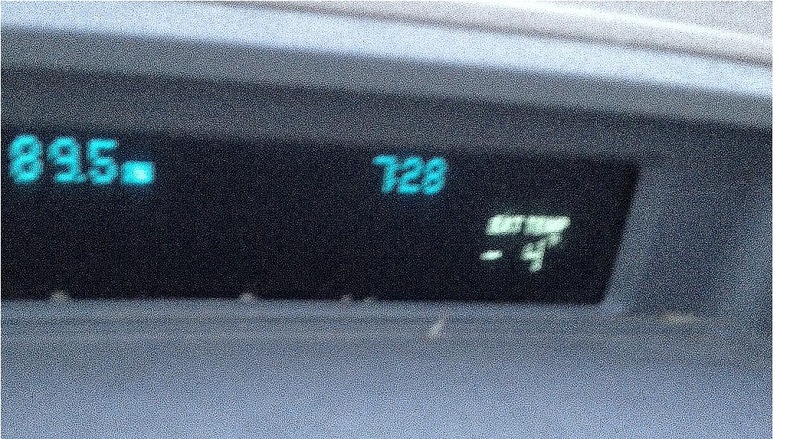 Combined with the below zero temperature, that’s colder than I’ve felt in some years. So far, me and my critters, including the chickens, are holding on and doing well. Doodle even crowed this morning, which was a welcome sound after listening to the wind roar and watching the temperature drop lower and lower through much of the night. Tonight the temperature is supposed to stay above zero but since it’s still only 2 degrees at 1 p.m. I’m not sure I believe that. Still, the wind is beginning to diminish, if still in the double digits, so that’s some improvement. I’ll take what little improvement there is wherever I can find it. Mornings are still quite dark. I took the photo of Roundtop yesterday around 7:30 a.m. 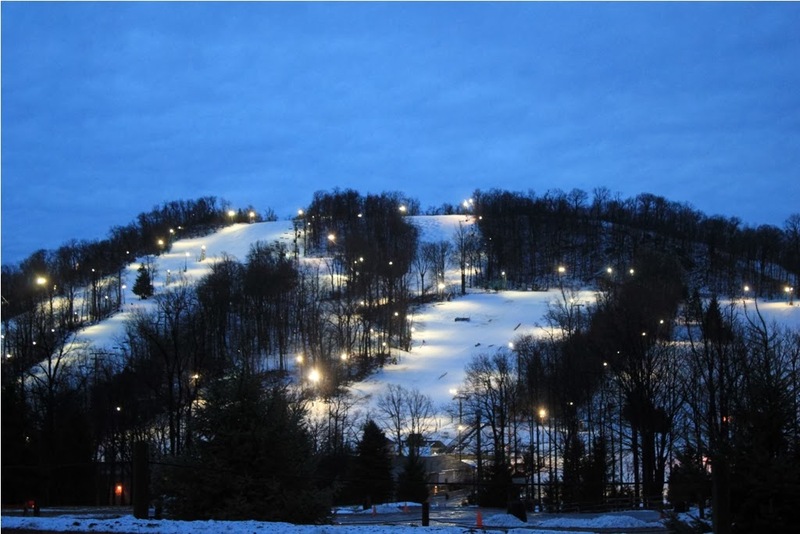 It was still too dark to take a photo out in the woods, so I let the lights on the ski slopes mountain brighten the image. I’ll be happier when it’s finally light enough in the mornings to take photos in the woods again. Oh, and it wouldn’t hurt to be a bit warmer, either. Doodle, my rooster, didn’t even crow this morning, not that I blame him. 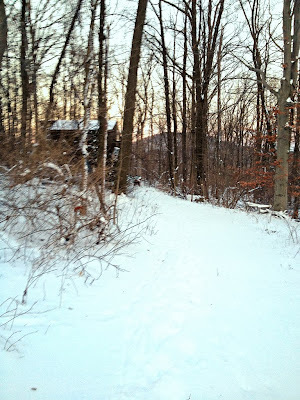 It was 6 degrees F at the cabin this morning under a fierce 20+mph wind. Snow covered the bottom of the chicken coop, so the girls weren’t eager to walk down the ramp to reach their food and water either. The cabin got at least 5” of snow and I wouldn’t disagree if someone told me it was really 6 or 7 inches. This light, fluffy snow is blowing all over the place, uncovering the ground in one spot and then depositing it elsewhere to make another spot twice as deep. Once off the mountain, the inches of snow that fell dropped quickly, down to just 3-4 inches within a mile or so. Still, the roads are drifting shut almost as fast as the road crews pass. Mt. Airy Rd. 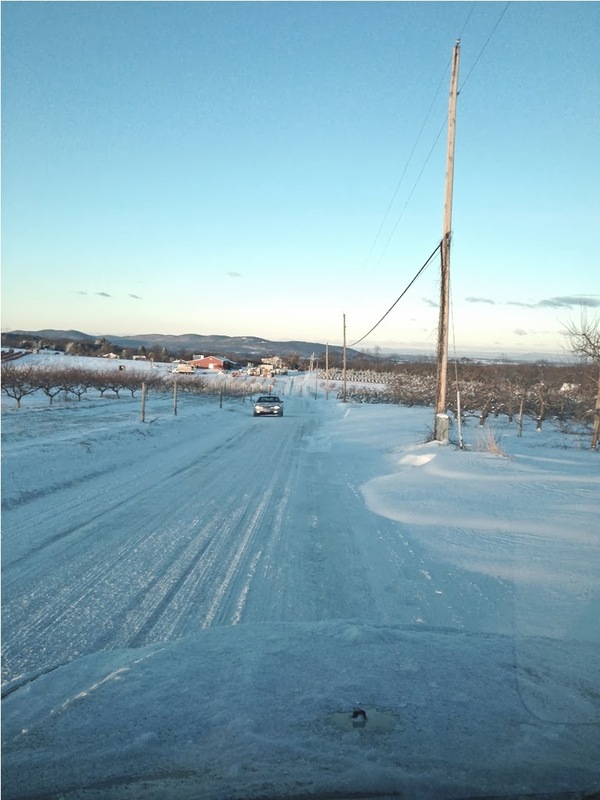 was down to one lane of travel within an hour of the plow’s passing. This is snowglobe snow. You couldn’t build a snowman if your life depended on it. The snow is as light as paper. I could broom it off my decks this morning. Actually, I could probably huff and puff and blow it off the decks, it was that lightweight. It would be a great snow to play in, if only that bitter wind would relax. Maybe tomorrow. Snow has begun to fall. 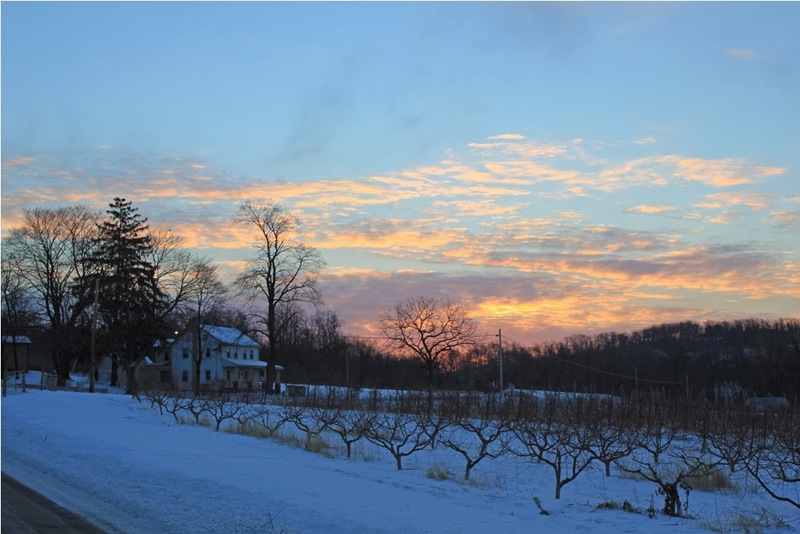 Even without a weather report, I could see the storm that was to come in last night’s sunset, the first of the new year. Storm totals are predicted low, then higher, then lower again. I am taking no bets on how much will fall at my cabin. 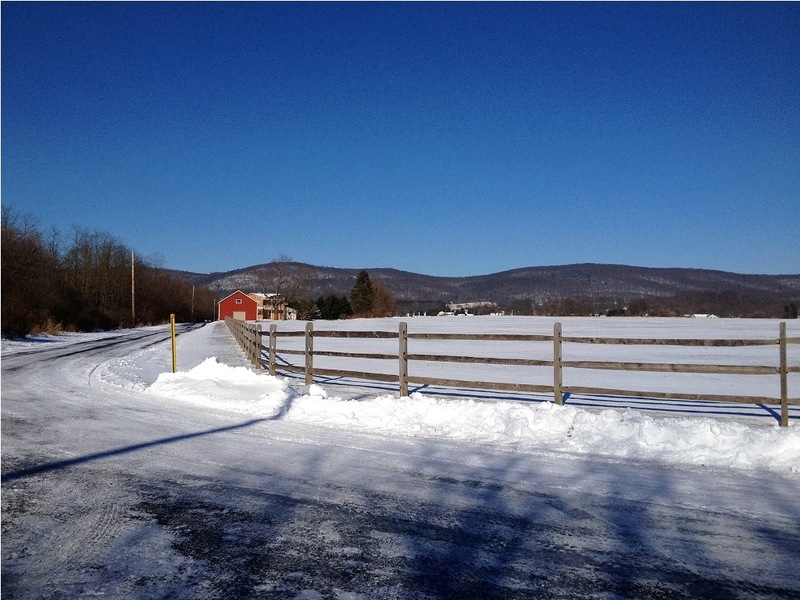 Roundtop often gets quite a different amount than what falls in nearby towns anyway. I can’t tell you the number of times I’ve refused to move the car because the roads up on the mountain were bad. And when I finally do deem it safe enough to travel, I find that the roads down in the valley are not only cleared but dry. That’s always a shock and has caused me no end of embarrassment when I tell co-workers the roads were too bad to drive on. I don’t think they believe me, those urban and suburban denizens whose high-heeled boots never actually touch the earth as they travel from living room to garage to parking lot and back again. Where I live, weather is often the focus of the day. How hot or cold will it be? Will I need sandals or Yak-trax? Do the chickens need more straw? Will my water pipes freeze? To me, the weather is a bit like a neighbor who can be fun but just as often brings trouble. Today, I’m expecting a bit of trouble.